Next from Tomoko Fuse’s Kusudama Origami book. I did something different this time. Since my last one was so fiddly, I opted to use full-size (15cm) paper this time. I didn’t realise that I wouldn’t need it for this one. 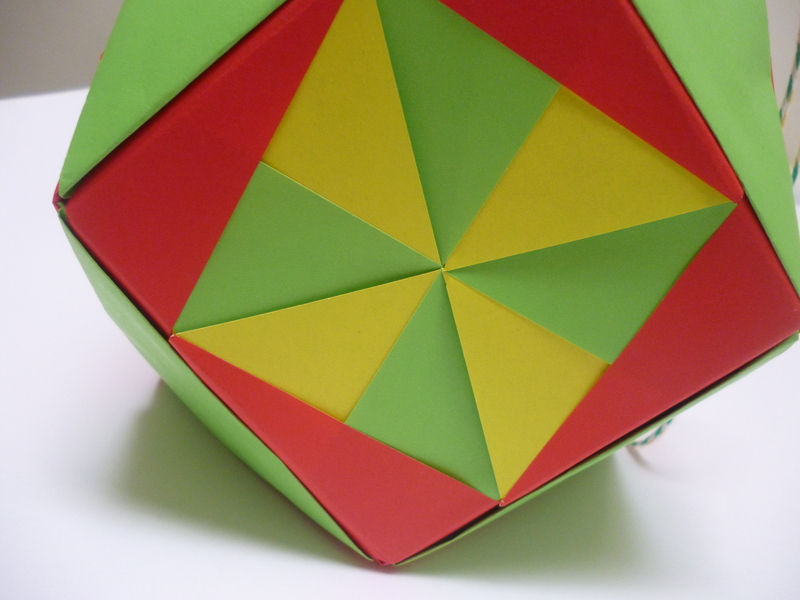 This model is called “Nejire Shikaku Mado” (ねじれ四角窓 – Twisted Square Window). A square frame containing a pinwheel-style pattern. 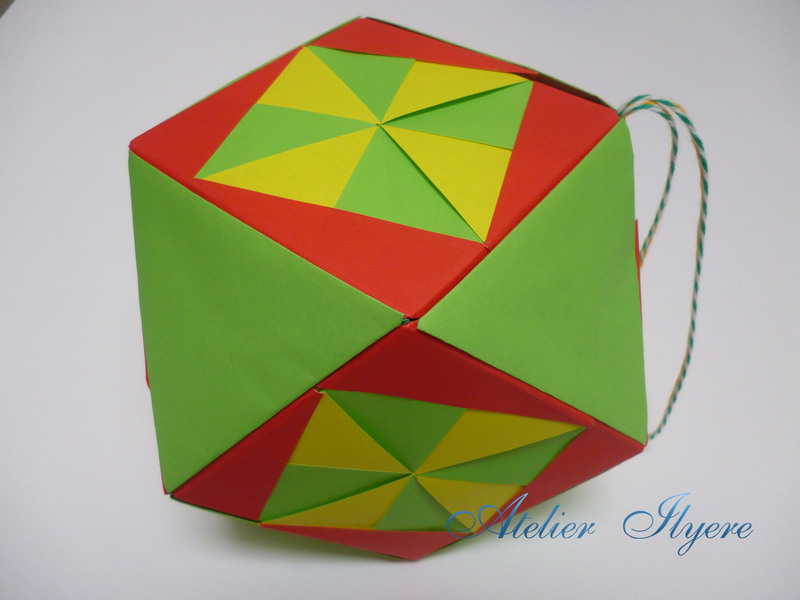 I used light green and yellow double sided paper for the pinwheel, and red paper as the frame. The book suggests that a red and white checkered pattern should be used for the triangular pieces, but I didn’t have any. So I chose the same shade of light green. I used light green and yellow coloured twine to match. The model was so large that I didn’t add anything else to the end of the string. Seriously, it dwarfs all of my previous designs! I hang all of my designs on my door handle, as you can see below. Next time, I won’t use 15cm paper for such a large model, but I will do when the folding is complicated, just like my last one. Simple one for now as I’m moving out of my current flat. I hope regular updates will resume soon, but it may take a few weeks to get everything moved. 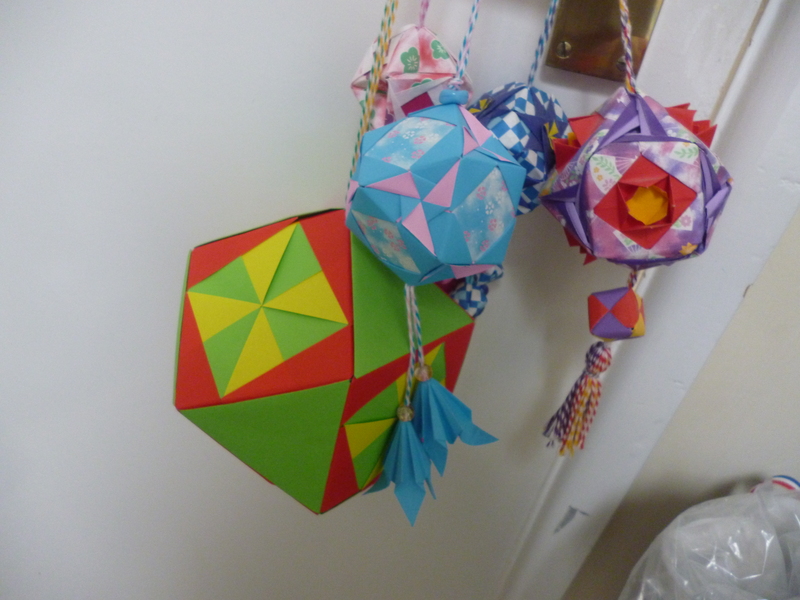 This entry was posted in Modular, Origami, Paper, Thread and tagged Kusudama, Modular, Origami, Paper, Tomoko Fuse. Bookmark the permalink.